Your new movie How to Beat a Bully - in a few words, what is it about? 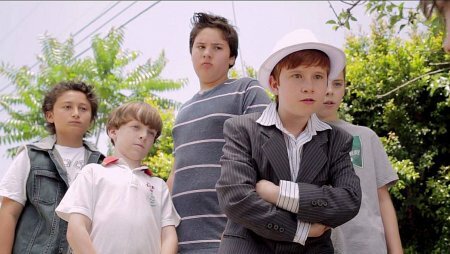 How to Beat a Bully is a family comedy about a 12-year-old boy who moves to a new town and gets picked on by bullies. To protect himself, he fibs that his dad is a hit man for the mob! When the rumor spreads to real mobsters, they capture the dad. The kid and his new BFFs save the day and his dad! How did the project fall together in the first place? RICHARD: Marilyn and I wrote the script after seeing Home Alone in 1990. We thought there was a need and opportunity for more family films. Right away, we got a lot of interest in the script and had tons of meetings. But then a few family films came out that were flops, and the studios didn�t want to do them anymore. Over the years we optioned it several times, but getting all of the right elements to fall together in the right way got us close, but not greenlit. Finally, Marilyn said it was time to stop optioning the screenplay. If someone wanted it, they would have to buy it. MARILYN: We actually optioned the script 8 times to 8 different Hollywood producers, each saying they would get the film produced. Finally, I said �no more options.� As soon as I decided that, everything started to happen. I found an investor who loved the project. Then I teamed up with Dream Factory Entertainment and they brought in another investor. Within 6 months, the film was cast and in production. So sometimes, you just have to �stop waiting for Hollywood� � and go do it yourself! What were your sources of inspiration when writing How to Beat a Bully - and does either of you have any first-hand experience with bullying, actually? RICHARD: Marilyn and I each had personal stories of being bullied, which we included in the movie. But the source of inspiration was looking for a common, universal story that everyone could relate to. Bullying certainly met that qualification. We tossed around various story ideas, and the problem of being the new kid in town was one of those elements. The idea of using one�s wits to outsmart bullies was very appealing� and once we hit on the idea of our hero spreading a rumor about his father, it was great fun to see how that rumor could race out of control! So our story explores family relationships, schoolmates and bullying, the strength of friendships, the small town rumor mill� we really cover a number of universal stories. MARILYN: I was bullied in high school by the �tough girls�. One girl used to hit me every time she passed me in the hall. I gave that story to the mom in How to Beat a Bully. I added a beat about how we got to be friends again, except that didn�t happen in real life. Another time a girl punched me in the face at a hamburger drive-thru. I didn�t put that in the film � but the weird thing is, this girl recently tried to become my friend on Facebook! I�m guessing she doesn�t remember that she punched me, but I do. Richard told me he was bullied in school and the kids called him �melonhead�. So we put that in the script, too. Of course, our other inspirations were lots of comedy movies and our love of humor in general. Being comedy writers, we wanted to make a fun and entertaining film, yet still have it be meaningful in some ways. What can you tell us about the writing process, how did you collaborate? And how have you two first met, even? RICHARD: I don�t know how other teams write, but I have a feeling our way of working is unique. We sit down and spend endless hours procrastinating. Oh, wait, that�s what everybody does. The unique part is that we work out the whole story, then we begin the specifics by going through each scene and working out it out in detail. Then, we will each take a pass at the scene. We then each read our version and smoosh the best of each into one complete scene. I�m always amazed at how well this process seems to work. I have some strengths in my writing, and Marilyn has other strengths. Somehow, our two styles seem to enjoy the smooshing process. MARILYN: Yeah, I really love smooshing, but Richard has a wife. He calls me his other wife. The two of us really enjoy working together. Years ago, we would always get together in the same room to write. But now, since we don�t live close by, we do it on the phone or via email. To write a script, first we break the story together: We discuss the characters, who they are, what they want, what makes them tick, and then we put them in situations with lots of obstacles to overcome. We block out the story, create the scenes and smoosh a lot. Actually, it makes the first draft seem more like a 3rd draft, because we�ve each written the scenes once ourselves, and then we�ve reworked them together. After we have a complete draft, we go over it again and again and make fixes. We also read it aloud so we know how all the characters sound and if the dialog feels right. So by the time we�re ready to send it out, it�s probably a 5th or 6th draft. RICHARD: As far as how we met, we may have different recollections of it. My recollection was that I had been working with a partner, and a number of things happened where I didn�t get on a sitcom staff, and a special we were developing for ABC fell through. We decided to keep our friendship healthy by splitting up as a team. I wrote some spec scripts, but I really prefer working as a team. Writing can be a lonely business, and it�s more fun to work with someone. I asked a mutual friend if he knew any writers looking to team up. He gave me a list of a few people, and I met with them. The one who seemed to be closest to my sense of humor and style was Marilyn. We decided to give it a try, and here we are, 26 years later! MARILYN: A mutual writer friend recommended that we meet since we were both moving on from working with other partners � and we were each looking to team up with someone new. I remembered seeing Richard and his wife sitting behind me at the Writers Guild Theatre where they had screenings of films. So he was familiar to me, even though we didn�t know each other. After we met, we read each other�s work and talked about writing. Since we seemed to have similar sensibilities and goals, we decided to work together. It was a match! A few words about How to Beat a Bully's very own brand of comedy? 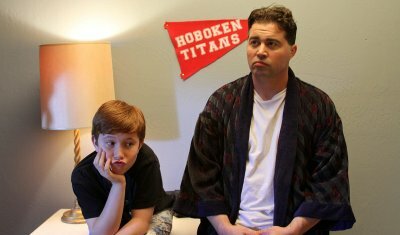 RICHARD: How to Beat a Bully is a family comedy of errors. It�s about mistaken identity, small town fear and gossip, and big time fun. MARILYN: It�s a broad comedy and a type of farce, yet it still has likable characters who exhibit genuine feelings and a family that seems relatable and authentic. With How to Beat a Bully being family entertainment, is that a genre you feel at home at? RICHARD: Oh, yes! We�ve actually written three family entertainment screenplays, so we are very comfortable writing about families and the different dynamics. I had a lot of practice writing about families, because I was a story editor on the TV show Full House. MARILYN: I�ve been writing comedy a long time, and love working in that genre. It�s fun to write a family comedy since you get to explore the �voice� and life experiences of people of all ages. The film has characters in it from 8 � 80 years old. I also like writing romantic comedies, and even wrote a book about relationships that�s published in ten countries: Never Kiss a Frog: A Girl�s Guide to Creatures from the Dating Swamp. I�ve written for a number of TV shows including Murphy Brown, FAME, and Sherman Oaks, and I was on the writing staff for Carol & Company that starred Carol Burnett, Richard Kind and Jeremy Piven. I�ve also written multiple episodes of Friday the 13th � The Series. Some writers work in only one genre, but both Richard and I have worked in several different genres, although I think comedy is the most fun for us both. Do talk about How to Beat a Bully's director Doug Bilitch, and what was your collaboration with him like? RICHARD: Once the director gets the script, it�s his show. But he was always open to hearing our thoughts and suggestions. So it was a good working relationship. MARILYN: We were fortunate that Doug shared our vision and we like what he brought to the film. Because we originally wrote it as a high budget movie for the studios, we had to make some changes due to budgetary considerations. We had to streamline the script a bit, taking out some characters and some scenes that were too physically and financially demanding for a lower budget film. But Doug was able to keep the story and tone of the film and we think he did a great job. Of course, there are a few places where Richard and I wish we could have kept in more jokes, but overall, we were both quite pleased. To what extent were you involved in the actual making of the movie, and if at all, what can you tell us about the shoot as such? RICHARD: The lines of communication were very open. Marilyn was one of the executive producers, so she had a lot more input at all levels. But I was able to bring a song my son wrote for the film to the attention of the producers. Fortunately, they liked the song, so it�s in the end credits. I was thrilled to be able to open that door for my son who had just graduated college as a music major. That probably would not happen in a studio film. MARILYN: I was very involved in all aspects of it, and included Richard in everything since he�s my writing partner. We were both at all the casting sessions and had lots of input. The whole casting process was quite collaborative. We had so many people behind the desk when actors auditioned, you would have thought it was for a multi-million-dollar movie! But the fact is, we pretty much all agreed on who we liked best for each part. I suggested a composer for the musical score � Emmy Award-winning Misha Segal. He met with the director and was hired. I also brought in Reverse Order, the band that contributed 3 songs to the film. The group was a semi-finalist on America�s Got Talent and they loved that the film had an anti-bullying theme since they do a national tour of 250 schools with an anti-bullying concert. In addition, I secured several of the locations, and raised the majority of the funding, so I really earned my executive producer credit. Once the filming starts, it�s really hard to have a lot of input, since it was a tight shooting schedule and with kids in the film, there are time rules to which you must adhere. However, one day on location at the stables in the climactic scene, I saw a couple of horses doing something really funny, so I insisted they film the horses and put them in the film! Now I can say I got them into show biz! RICHARD: Marilyn and I are working on a young adult novel of How to Beat a Bully, and we just completed a romantic comedy that is slated for production later this year. MARILYN: The romantic comedy is Cold Feet � A Wedding Tale and it will be directed by Arthur Allan Seidelman. I also have two other features in the works, one a buddy comedy and one a thriller. In addition, I created a webseries to be launched soon, along with a book of the same title: How to Live Like a MILLIONAIRE� When You�re a MILLION Short. MARILYN: Yes, if anyone wants to hire us to write a new film, we�re available! RICHARD: Yeah, what she just said!